MPs have decided to try to break the Brexit deadlock by holding a series of "indicative votes". But what does it mean? 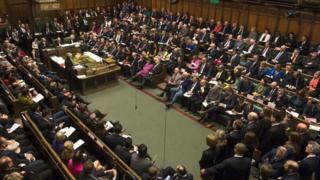 Usually the government has control over what happens day-to-day in Parliament, but on Monday evening MPs backed a proposal by a cross-party group of MPs, including Labour's Hilary Benn and Conservative Sir Oliver Letwin, to take control of the timetable. During the indicative votes, MPs will enter one of the division lobbies - the corridors in the House of Commons where votes are normally counted - and will receive a paper ballot. They can vote "yes" or "no" on as many options as they are prepared to support. Usually, MPs are instructed to vote with their party line (a process known as "whipping") and they can face repercussions if they don't. But with indicative votes, MPs might be allowed "free votes" - where they can choose to vote as they wish - meaning the final outcome could be substantially different. Does it tie the government's hands? The Prime Minister Theresa May has also warned that the votes could lead to an outcome which the EU would not agree to. But haven't MPs already voted on all the options? MPs have had a number of opportunities to vote on different ways forward, and, as Mrs May has pointed out, they have "equally been rejected". But these were all "whipped" votes and each proposal was taken in isolation, rather than side by side. Can the UK revoke Brexit? What is the Norway plus option?